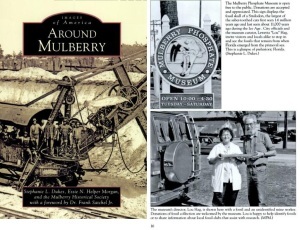 The following text is an excerpt from the soon to be published autobiography, “The Old Man of the Mountain: An Autobiography by Leon B. Gathany,” in which Leon recalls collecting fossils at the Mulberry Phosphate Pits in Florida. 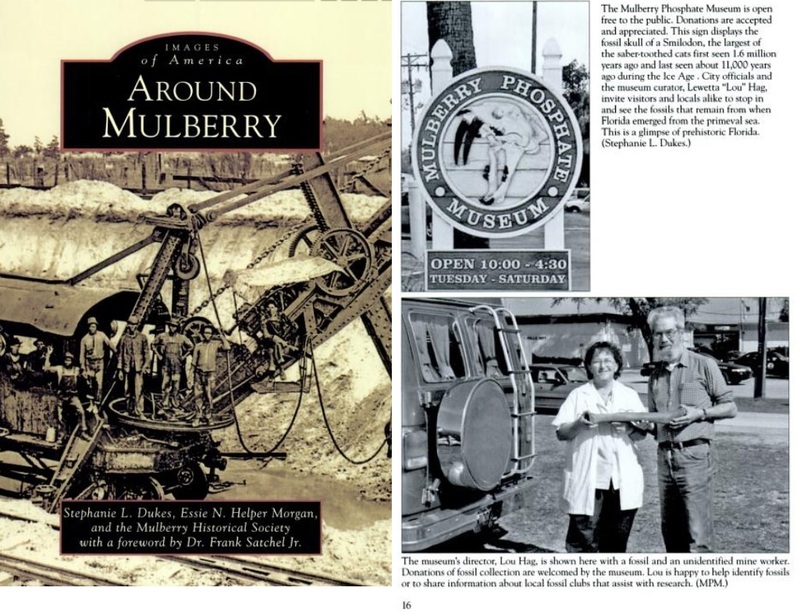 The photos above were published in the book “Images of America: Around Mulberry,” a project of the Mulberry Historical Society. Click on the image to view the description where Leon is mistaken for a mine worker holding a dinosaur bone from the pits. The collections obtained during his visits there are a part of the many artifacts on display in the Leon and Rachel Gathany Museum of Natural History. Actually I did not collect fossils until I was in my forties. It happened this way. I was in Dr. Bandy’s office one day, but I don’t remember the reason I was there. I was the Principal of the high school so he probably was talking to me about some of the issues in the high school. As I got ready to leave he said, “By the way, here is a letter from a man down in Florida. He wants to give our school a fossil collection, but we really don’t have any place to house that collection on the Toccoa Falls campus, so I’ll let you take care of the letter”. When I read the letter, it was from Bill Smith who lived in Lakeland. He was a former student of Toccoa Falls. He had become a fossil collector in his area and he wanted to give Toccoa Falls a portion of his fossil collection. It is very easy to teach creation with the fossils that you find. I wrote to him and said, “It appears that the school doesn’t have a place for the fossil collection, however I do nature programs at schools and at the parks and I would be very happy to have you share some of your fossils with me”. So he wrote me back a short letter and said, “Come and get the collection”. I believe Richard (my eldest son) and I went down to Lakeland where Bill lived and he gave us a very interesting collection that I could use in my programs. Then he said, “Stay here and tomorrow we will go out and I will show you the places where these fossils are found”. Just south of Lakeland is an area of phosphate mining called Bone Valley. At the beginning of this valley is a place called Mulberry and then there is another place more off toward the east by the name of Bartow. Let me explain to you about phosphate mining. Actually, these big drag lines would go in and they would clean off sometimes as much as ten feet of over burden. Over burden is the layer of soil directly over the fossil layer. Believe it or not the very next layer was a fossil layer. The people who ran the mines were interested in phosphate ore which was the next level and they processed this ore and it was used as fertilizer for plants. It was my fortune to meet a man by the name of Wood that was the manager out in the field. His wife worked in the main office of this particular phosphate company so they were able to get me passes to the phosphate pits. That first day, Bill took Richard and me out and we went down there and we were thrilled by what we found even that day. From that time on, a couple of times a year, I would return to that area and Mr. Wood and his wife would get me a permit to the phosphate pits. It is amazing the things that I found and I can’t even began to enumerate them at this point, but the best I remember is these huge drag lines would scoop up over burden layer and many times it would include fossils. They would put it in a pit where there was a strong flow of water that would wash out the phosphate ore and then they would send the ore back to the processing plant. When they abandoned those pits, we would just find all kinds of beautiful things. So I kept adding to my collection. After Bill had given us these beautiful fossils, I took them back to my home. I don’t remember exactly all of the items, but I remember one was a mammoth tooth, a mastodon tooth, pieces of petrified wood, sea cow ribs, and huge sharks’ teeth and no telling what else he gave me. Well, as the years went on, Bill got to the point where he was not too well and he had a personal collection of his own. One time, when he was out in the pits, he found a unique specimen and he didn’t know what it was. He was pretty good at identifying what he found, but he couldn’t identify this object, so he took it to the Florida paleontological society department, which they had at the University of Florida. The man said, (the head honcho) “I don’t recognize what this is, but I’ll do some research on it”. He couldn’t figure out what it was either. “If you will leave it, I will find out what it is. I’ll name it and I will put your name on it”. In other words, sometimes when a unique specimen is found, they name it after the technical name, and then they put the name of the finder. About three years later Bill had not heard from this man, so he went up to see the professor personally and would you believe the man said, “I don’t know what you are talking about”. That really disturbed Bill to the point where he told his wife, “When I pass away, I want Leon Gathany to have my collection”. Well, Bill did, I believe, have a heart attack and passed away. His wife called me and said, “Come and get the fossil collection. The University of Florida wants it but Bill wanted you to have it”. Most of the fossils that I have in the barn were gifts from Bill Smith. I’m very thankful to Bill Smith, who is my fossil mentor. I think I will say, once I became interested in fossils, I found that there are fossils in a lot of different places in the United States. Actually there are sea fossils, shells down quite deep in Great Bend where I practically had been raised up. In Myrtle Beach, South Carolina, we found fossils on the beach. There was a site in North Carolina, known as the Texas Gulf where they processed the ore phosphate. There was a huge pit and I went up there several times. 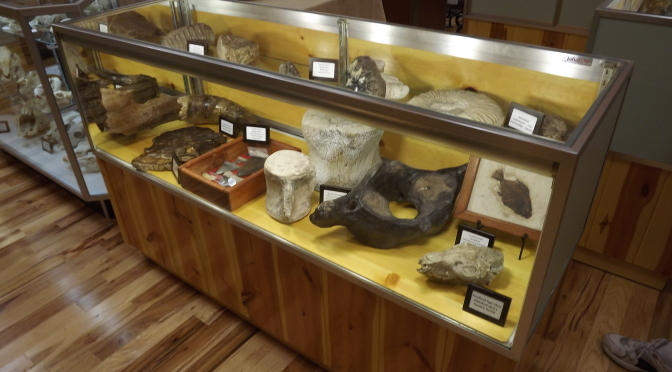 For a time, I was a member of the North Carolina Fossil Society and I hunted there several times. Then, when I moved to Minnesota and went to Wyoming to hunt deer and antelope, behold there were fossils out there. One unique specimen I found had four attached vertebrae. I showed this fossil to an expert paleontologist and asked him to identify it. He said, “Oh my goodness, that’s easy. Those are the vertebrae of an extinct marine fish”. I found this while I was mule deer hunting. If you know the term marine, you know that that means ocean. I said, “My friend, how does it happen that I am finding a marine fossil at an elevation of 8,000 feet?” He was actually an evolutionist. I said, “A marine fossil at 8,000 feet?” and he said, “Well, yes. You know the whole earth was covered with water at one time”. I said, “Yes, I know that”. He looked at me kind of sideways and he said, “How in the world did you know that?” I said, “It tells us in Genesis, where it talks about Noah’s flood.” He turned on his heels and, in disgust, walked away from us. Thanks for your kind comments, Mike. We hope many more folks will be able to visit the Museum, see these “treasures” and share in the experiences you have had. I remember when Leon came down to Lakeland to hunt fossils with Bill Smith ( my dad ) the barn and the museum are full of treasures , I’ve known Leon for 40 + years he is a wonderful man and friend. He has turned 94 recently and we love him so much.